Detail your Chevrolet vehicle with these "Polyurethane Domed" gems that can be placed just about anywhere (wheel centercaps, fenders, door posts, etc.). Gems are manufactured with a Silver Metallic base and a Red Bowtie design with Black outlines as shown. 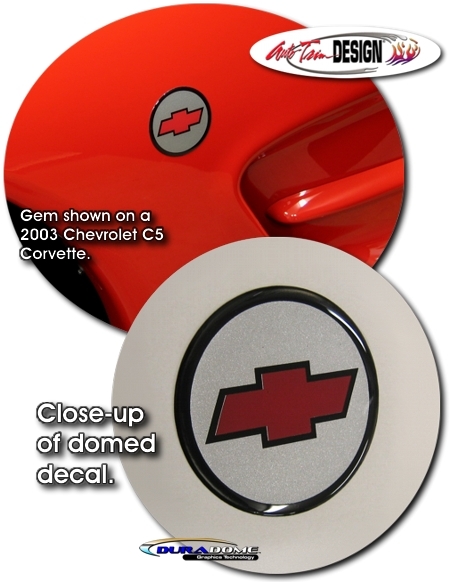 "Domed" decals are not just vinyl decals. They are a tactile, three (3) dimensional decal that looks like a factory manufactured emblem. They look Fantastic! You are provided with a set of two (2) gems with easy to follow general online application and care instructions.